The next application deadline for Minnesota Historical & Cultural Heritage Grants Program small grants is next Friday October 11, 2013. Completed applications must be submitted via the grants portal before midnight on October 11. Contact the Grants Office with questions. A permanent exhibit housed in the milk house that describes the purpose of the milk house, the processes that occurred there, and the connections to the local dairy economy during the 1945-1960 era. Rice County Historical Society has big plans for their facility! Check out a series on African-American philanthropy and museums. Congrats to Split Rock Lighthouse's Lee Radzak for preserving North Shore history. Commemorative Air Force Museum is family-friendly. Using Kickstarter to raise funds for history. Learn more about the Internet Archive. Does the government shutdown affect National Parks? The shrinking of social studies in American schools. Anoka County Historical Society, Anoka MN, seeks Volunteer Coordinator. Deadline: 5 p.m., October 18, 2013. Nebraska State Government, Lincoln NE, seeks Preservation Associate. Deadline: October 27, 2013. Milwaukee Public Museum, Milwaukee WI, seeks CEO & President. Deadline: October 31, 2013. University of Wisconsin-Stevens Point seeks Assistant Professor, North American Public History. Review of Applications begins November 1, 2013. Neville Public Museum, Green Bay WI, seeks Museum Director. Heritage Hill State Historical Park, Green Bay WI, seeks Executive Officer/Business Development Manager. City of Elmhurst (IL) seeks Registrar. Position open until filled. Ramsey County Historical Society, St. Paul MN, seeks Loyalty Marketing & Membership Coordinator. Position open until filled. Winona County Historical Society, Winona MN, will host photographer Doug Ohman, who will speak on one of his new projects, Cemeteries of Minnesota, October 3, 2013, 7 p.m. Free. Call 507-454-2723 for more information. Join Rockford Area Historical Society, Rockford MN, and the City of Greenfield for the Fall Bonfire and Game Night, October 4, 2013, 5-7 p.m. at the new Greenfield City Park. Call 763-477-5383 or 763-477-6464 for more information. Landmark Center, St. Paul MN, and Lakeshore Players present "James J. Hill: Railroad Empire on Trial," October 3, 4, 5, 2013, 7 p.m., F.K. Weyerhaeuser Auditorium, Landmark Center. Tickets: $5; call 651-292-3276 to purchase. Anoka County Historical Society, Anoka MN, announces their "Monuments to Life" Cemetery Tours, October 5, 10, and 12, 2013, 7 p.m. See the ACHS Calendar of Events for locations. Tickets: $8/tour, or $21/all three. Call 763-421-0600 for more information or to reserve tickets. Docomomo US/MN presents Minnesota Modern Tour Day, Saturday October 5, 2013, 10 a.m. to 5 p.m. Advance ticket sales available online. Stearns History Museum, St. Cloud MN, hosts John Decker, Director of Archives, who will discuss post-WWII Cold Spring MN, Wednesday October 9, 2013, 9 a.m. See the Breakfast Club website for more information. Steele County Historical Society, Owatonna MN, invites the public to a presentation on "Uncle Sam's New Deal," Thursday October 10, 2013, 7 p.m. Call 507-451-1420 for more information. Winona County Historical Society, Winona MN, hosts the 14th Annual Voices from the Past: Woodlawn Cemetery Walk, October 12 and 13, 2013. New this year--indoor performance for those needing a fully-accessible experience; Thursday October 10, 2013, 7 p.m. at the History Center. Tickets: $7/adults; $5/students 13 and up; $3/ages 12 and under. Call 507-454-2723 x0 for ticketing information. Ramsey County Library-Maplewood will hold "Tracing Your World War II Ancestors," Tuesday October 15, 2013, 7 p.m. This is part of the series "World War II: a New Look at the 'Good War.'" Call 651-724-6022 for more information. Ramsey County Library-White Bear Lake hosts a history program presented by White Bear Lake Area Historical Society. "White Bear Fire Department Turns 125!," Wednesday October 16, 2013, 2 p.m. Call 651-724-6022 for more information. Ramsey County Library-Roseville, will hold a book discussion on "Inferno: the World at War," by Max Hastings, Thursday October 17, 2013, 7 p.m. Call 651-724-6022 for more information. Minnesota Chapter of the Society of Architectural Historians (MNSAH) fall tour features the work of Cass Gilbert in the Summit Avenue area of St. Paul, Saturday October 19, 2013, 9 a.m. to noon. Register online by October 17, 2013. Contact Rolf Anderson, 612-824-7807, for more information. Northfield Historical Society, Northfield MN, presents the 8th Annual Cemetery Stories, October 19, 2013, Northfield Cemetery. Tours begin at 3:40 p.m. and repeat every 20 minutes; last tour is at 8 p.m. Admission: $4/adults; $2/children; $1/NHS members. Call 507-645-9268 for reservations. Steele County Historical Society, Owatonna MN, announces the opening of their newest exhibit, "Uncle Sam's New Deal," a traveling exhibit from the Minnesota Historical Society and Landmark Center. Open now through January 20, 2014. Call 507-451-1420 for more information. If your organization has been thinking about signing up for the AASLH StEPs program, register for a free one-hour informational webinar, October 9, 2013, 2 p.m. ET. Janet Timmerman has been hired as Murray County Museum Coordinator for the End O Line Railroad Park & Museum, Currie MN, and Murray County Historical Society, Slayton MN. A Murray County native, she will return to the area to start her new job on November 4, 2013. Congratulations, Janet! Clothes Tell Stories is a web-based resource for using costumes to tell stories. Bridgewater Township, Rice County MN, is proud to announce that their township records from 1858-1889 are now available through the Northfield History Collaborative. The Museum at Bethel Woods, Bethel NY, announces the availability of its current special exhibit, "Keeping Time: the Photography of Don Hunstein," as a traveling exhibit, available beginning January 2014. Contact Wade Lawrence, Museum Director, for more information. Register now for the Minnesota Association of Museums 2013 Annual Meeting, October 6-7, 2013, St. Joseph and Collegeville MN. 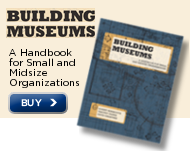 Reminder: Institute of Museum and Library Services offers Museum for America Grants. Deadline: December 2, 2013. While Marcellus from Shakespeare's Hamlet might be disturbed by affairs in the State of Denmark, he certainly would be delighted with history in the township of the same name here in Minnesota. Brent Peterson, Executive Director, Washington County Historical Society; Wayne Boyd, President, Denmark Township Historical Society; Joe Hoover, Field Services, Minnesota Historical Society were at a celebration honoring friends and donors who raised the $80,000 needed to purchase the Valley School as the new home of the Denmark Township Historical Society. The school was built in 1852 and is still on its original site. Soda Shop Salvation, by Rae Katherine Eighmey.